This is one of my favorite dishes but also one of the hardest to photograph. The best photo setup would probably have the chicken in some kind of rustic clay pot or stoneware, surrounded by the lemon ginger sauce with a sprinkling of bright green cilantro and colorful ramekins containing chutney and raita on the side. Unfortunately, I don’t always have such luxuries at my disposal. But this doesn’t stop me from making amazingly delicious Indian food (and it shouldn’t stop you either). Now that we are clear on what this dish should look like, the scrumptious details can be appreciated. Like much of the best Indian food I’ve had in my life, this recipe adaptation comes from from my step mother. 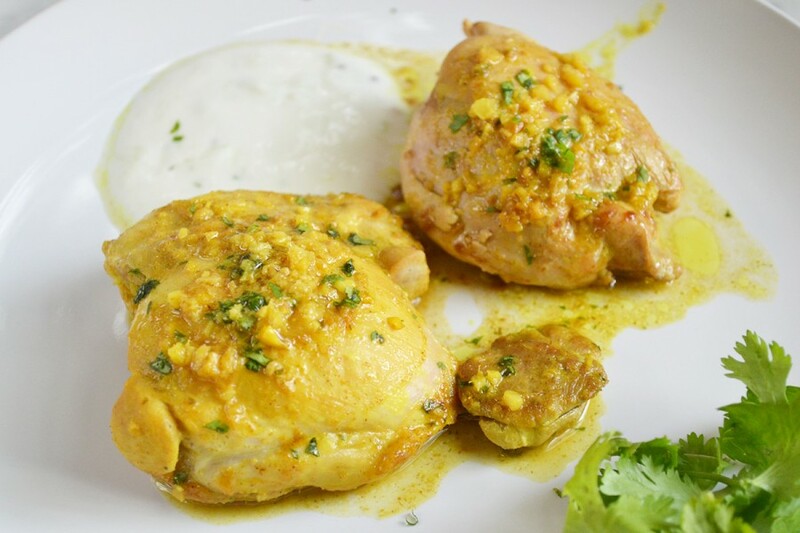 Modified from recipes by Linda Fraser and Madhur Jaffrey (who is arguably the queen of popular Indian cooking), this tender chicken and spicy tart sauce packs so much flavor, I often find other chicken preparations boring or unsatisfactory by comparison. I prefer dark meat for this dish but chicken breasts work well too (reduce cooking times slightly for boneless meat or breasts). The chicken benefits from a powerful combination of garlic, ginger, chili pepper, lemon, and a go-to curry spice mix of ground coriander, turmeric, and ground cumin. Chopped fresh cilantro is stirred into the sauce right before serving the chicken over a mound of rice (optional). Homemade raita, a cooling cucumber yogurt mixture, and spicy chutney or pickle – my favorites are Swad coriander chutney and mango pickle (available at Indian grocery stores or Patel Bros) can be served on the side. Unlike the Indian food you are most likely accustomed to, there’s no heavy cream, it’s not overly oily, and the heat can be adjusted to your preference. Although this is fairly different from the Indian recipes my grandmother has in “The Art of Good Cooking,” I think she would appreciate its authenticity. Always a fan of ethnic foods and considered a minimalist of her time, I imagine Paula Peck would be intrigued by the layers of flavor and what great leftovers this dish makes. As it sits, the spices blend together to make an even tastier, more flavorful sauce. This is the perfect affordable and healthy Sunday meal that can be eaten throughout the week. Heat oil in a large sauté pan (large enough to hold all chicken pieces in one layer). When hot, add chicken. Saute over medium heat, turning frequently, until browned all over. While chicken browns, place ginger, garlic, and chili pepper in a food processor. Chop for 10 seconds or until minced. Remove chicken from the pan and set aside. Add garlic ginger mixture to the pan. Saute for 1 minute. Add turmeric, cumin, coriander, salt, and pepper. Allow spices to toast for 1 minute. Add chicken and juices back to the pan. Sprinkle with lemon zest. Add lemon juice and chicken stock or water. Bring to a boil and then reduce to a simmer and cover. Simmer 25-35 minutes or until chicken is cooked through. Add ¼ cup more chicken stock or water if sauce and chicken gets too dry while cooking. The sauce should be thick and syrupy, not soup-like. Sprinkle with chopped cilantro and serve with rice, raita, chutney, and/or pickle. Peel and grate cucumber. Place cucumber in a cheesecloth and squeeze out as much juice as possible. Drain. Mix shredded cucumber with yogurt in a small bowl. Add mustard seeds, cumin seeds, and ground cumin.